Hello friends, Over at the Paper Players this week they are celebrating their 300th Challenge, and they also have prizes up for grabs too, so of course I wanted to play along! I hope a Retirement is considered a celebration to them? It sure would be to me! LOL I would be celebrating to the cows came home! I have been eyeing this SU set for quite sometime and I finally ordered it! It is called By the Tide and sure makes the best masculine cards! I also have this awesome turquoise embossing powder that I knew would look fabulous on that navy paper. I hope you have a fantastic first day of Summer, however you decide (or have) to spend it! I am still waiting for the window guys to show up! Why can’t some companies show up with they say they will? They were suppose to be here last Monday and they pushed me off a week, which was inconvenient. I don’t understand why they think it’s okay to make you wait with no phone call! What if I was working and not on summer break and had taken the day off? Okay, enough of my rant! Categories: Cards | Tags: By the Tide, Card making, Cards, retirement, rubber stamps, Stamping Up | Permalink. Oh, beautiful colors on your card!! And you are right this makes a great masculine card, I am with you on the congrats you are retired, that is a perfect reason to celebrate! Are you counting down the days!! 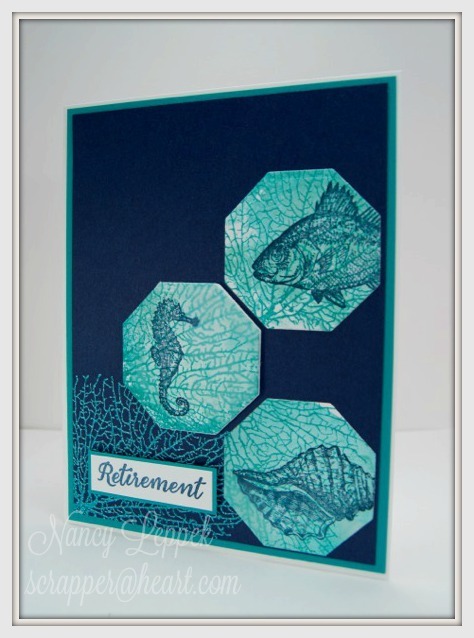 Wonderful card design with the hexagon shapes and sea theme. Love the colors too! Oh, I really love these colors. Such a great masculine retirement card and it certainly is a celebration…. The aqua and navy are fabulous together for an underwater card, Nancy. You were so right. This is a striking color combo and your card is great. Thanks for playing with our 300th celebration challenge at the Paper Players. You were right! the turquoise EP is beautiful! on Navy : ) Wonderful card I just love this design!! What a beautiful card! I love the colors and the sea life, so serene and perfect for a retirement card. Thanks for playing along with our 300th challenge at The Paper Players, Nancy! I don’t know how I missed this beauty! Love the colors and the hexagons are such a fun idea. Great retirement card!